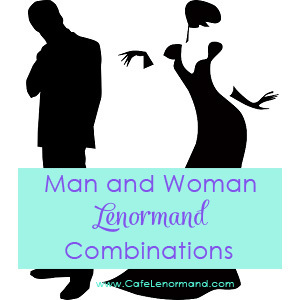 These Lenormand Man and Woman combinations are meant to help you learn how to read Lenormand combinations. There really isn't a different in combination meanings when reading with the Man or Woman. The same meanings apply to each card, so I have included them on the same list here. Please note that not every possible Lenormand Man and Woman combination is on this list. As you learn Lenormand, you'll find that the total number of combinations is endless. Until then, use these Lenormand Man and Woman combinations whenever you want to double-check your interpretations of a spread or need a helping hand in a reading. What do you think of these Lenormand Man and Woman combinations? Let me know in the comments below. I'd love to hear from you! It was intentional as neither cards are adjectives, but represent people. So if the man and woman appear next to each other is that intepreted as if you are the woman then the man is someone you know or yet to meet depending upon surrounding cards? Hi Becky, You may want to read this article on interpreting the Man and Woman cards.